So, as you can probably guess, this list is not definitive because I'm a MOODY READER, but just the top ten books that caught my eye when I looked at my TBR shelves. Rook by Sharon Cameron - This one has actually been on my wish list since BEFORE it came out. Luckily for me, my #OTSPSecretSister sent it to me in my August box! I've heard nothing but great things about Rook, and I'm super excited to read it! Dangerous Lies by Becca Fitzpatrick - Ahhh, so I wasn't a fan of Becca's (haha, name twinsies!) first series, but I actually DEVOURED Black Ice last year, when I was lucky enough to get a copy for review. I think that was around the time when I first started posting on ReadingTeen, because we did that huge giveaway with the tote I painted. Ah, the memories! SO I was DYING to get my hands on her new suspense novel, and I've started it but haven't gotten very far, because I'm in a slump. BOO! Soundless by Richelle Mead - I was absolutely ECSTATIC that I scored this one at BEA this year, and I have no idea how I haven't read it yet. I mean, Richelle Mead is bae, and I love all of her other books. My hopes are sky high for this fantasy. Please don't disappoint me!! Truthwitch by Susan Dennard - I have absolutely NO IDEA how I haven't read this one yet. No. I actually do, because I'm trying to hold off as long as possible so the wait for book 2 isn't as long. BUT I probably won't be holding off much longer, since I'm officially a Witchlander. WOOT AIR CLAN! Passenger by Alexandra Bracken - Aannndddd yet another I've tried waiting to read until I can no longer stand it. BUT IT'S OUTLANDER YA GUYS. UGH. I honestly might be picking this one up tonight now that I remember how EPIC it sounds. My self control is failing. Also, I really really love Alex Bracken, so there's that. The Detour by S.A. Bodeen - The Detour sounds so fun! A thriller about a YA author?! Gosh, now I want to pick this one up too!! I'll definitely be reading it soon! Ten Thousand Skies Above You by Claudia Gray - This is my #1 priority. A Thousand Pieces of You was one of my top three favorites from last year*, so OBVIOUSLY I'M FREAKING OUT THAT I HAVE THE NEXT BOOK IN MY HANDS FINALLY. Really, I'm keeping it cool. Scout's honor. *Honestly if you haven't read it yet, what in the world are you doing with your life?! GO GET IT KITTENS! Wolf by Wolf by Ryan Graudin - Inglorious Bastards meets Code Name Verity. DOES RYAN GRAUDIN HAVE A SNEAK PEEK INTO MY BRAIN AND WHAT IT WANTS FROM YA?! Because this is a dream come true, and I cannot wait to flail over this alternative historical world! These Shallow Graves by Jennifer Donnelly - Another BEA book I've held off on, but don't know how! SOON, MY LOVE, SOON! 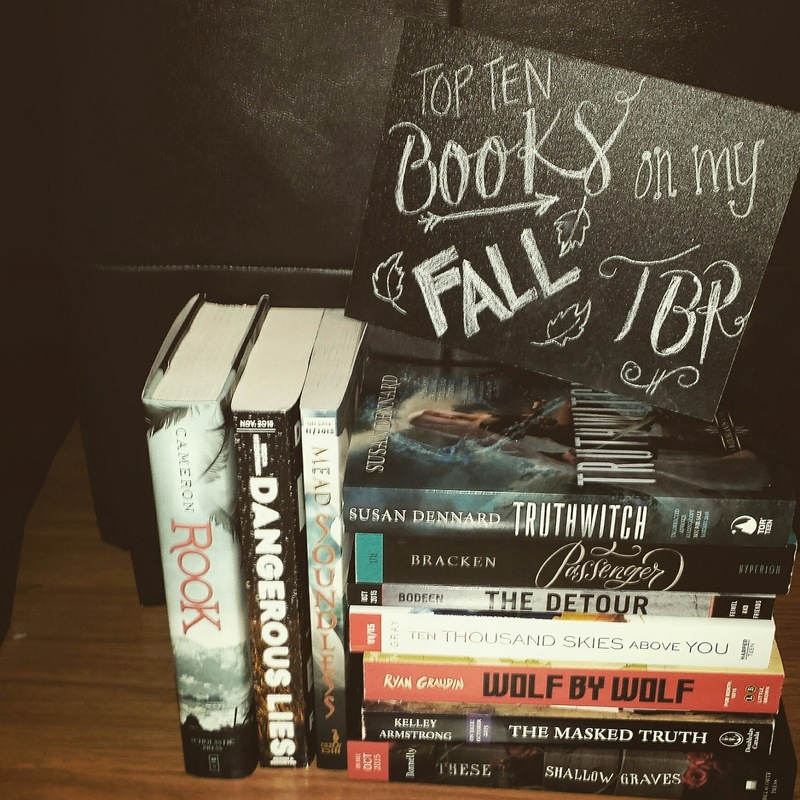 So...those are the top 10 books on my fall tbr....for now. What are some of the books on yours? Which ones on mine should I make a top priority? Let's discuss.